TRUMP IN THE MIDDLE EAST: THE NEW BRUTALITY | "Global Possibilities"
The disastrous January raid on an al-Qaeda target in central Yemen, just days after Trump took office, resulting in the death of a Navy SEAL and two dozen civilians, has been widely discussed. But since then, US actions have, if anything, escalated. In early March, US aircraft and drones carried out over thirty strikes against Islamic militants across central Yemen, almost equaling the total number of air strikes that were carried out in the whole of 2016. Many civilians were also killed. In Iraq and Syria, meanwhile, there have been numerous reports of civilian casualties in US bombing raids. 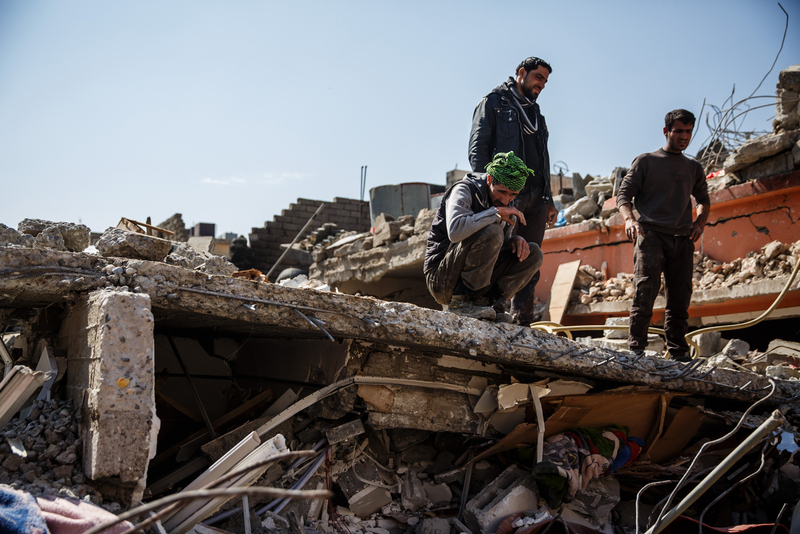 On Friday, it was reported that as many as two hundred civilians were killed in US airstrikes in Mosul. Meanwhile, four hundred US troops are on their way to Syria to set up an artillery base for the retaking of the ISIS capital Raqqa; another one thousand troops may soon be sent to Kuwait to act as a reserve force. More troops will soon go to Iraq in addition to the five thousand already there. And the Pentagon has demanded more troops for Afghanistan in addition to the 8,400 already there. The most startling example may be occurring in Yemen, where the US is intervening with almost no public discussion, debate in Congress, or even—as Western diplomats told me—coordination with NATO allies. The violent civil war in Yemen between the government and Houthi rebels who are Shia Muslims is now a regional conflict involving Iran on the side of the Houthis and the Arab Gulf states backing the government. Yemen is facing the “largest humanitarian crisis” in the world, with two thirds of its eighteen million people in need of aid, according to Stephen O’Brien, a senior UN official. On March 26, The Washington Post reported that the Defense Department is asking the White House to remove restrictions on providing military aid to Gulf allies who are fighting the Iran-backed Houthi rebels in Yemen. Already, unspecified US Special Operations Forces (SOF) are operating not only in Yemen, but also in dozens of other countries in Africa and Central Asia. Yet Yemen is still a minor issue compared to what the US plans next in Syria. Here too civilians are dying from US air strikes—thirty-three civilians were killed on March 22, when US led coalition bombers hit a school.) Will Trump support the Russian-dominated, UN-led peace process in Geneva? Is the US interested in forming a stronger Arab-Western alliance against the Islamic State, while also trying to broker a political solution? Is the US prepared to let President Bashar al-Assad stay in place? Who will pay for the flood of refugees still coming out of Syria or its future reconstruction? None of these questions appear even to be being asked by the White House. Clear answers become even more unlikely when the Trump administration is considering a possible one third cut in the $50 billion budget of the State Department and the Agency for International Development in order to fund a $54 billion increase in the Defense budget. Mick Mulvaney, director of the White House Office of Management Budget said on March 4 that the cuts would see “fairly dramatic reductions in foreign aid.” There has been widespread opposition from Congress, aid groups, and the media to these proposals. Such cuts would undermine the State Department’s ability to launch diplomatic initiatives or even influence future US foreign policy. The firing of many regional and country experts would create a vacuum at the State Department and only lead to greater disdain abroad for US diplomacy. The US will increasingly be unable to persuade autocratic governments to respect human rights, press freedoms, and civil society. Much of USAID’s funding goes to supporting civil society and non-governmental organizations abroad for which Trump has shown no interest; and budget cuts could have a severe effect on these activities. Secretary of State Rex Tillerson, who has barely made a dent in Washington and has failed to staff his department, leaving hundreds of ambassador slots vacant, has been silent on major foreign policy issues, avoided meeting visiting dignitaries, and isolated the media. There are serious questions about what part, if any, the State Department will have in the Trump administration’s foreign policy. Trump’s growing dependence on a military strategy around the world will reduce US influence with its allies and all major powers. It also makes it less likely that they will join what Trump hopes will be a crusade against the Islamic State. Autocrats around the world will follow the American example and be encouraged to abandon diplomacy and politics and use force to get their way. We will be left with a US that is set on inflaming conflicts rather than ending them, a US that abandons any sense of global responsibility and pays no regard to international agreements. A new global era has begun in which American allies can no longer rely on American leadership. It may be the most dangerous period we have seen in our lifetimes.